With spring in full glory and schedules ramping up in anticipation of summer, here are a few casual spots to dine out, with or without the kids. WALNUT CREEK – If you’re craving comfort food, but want something out of the ordinary, check out Walnut Creek’s Mangosteen Bistro. The menu highlights Vietnamese recipes that will soothe your soul. Skip the rolls and start with the rice flour sizzling crepe filled with shrimp, sliced pork, onion and bean sprouts. It’s crispy on the outside and savory inside. 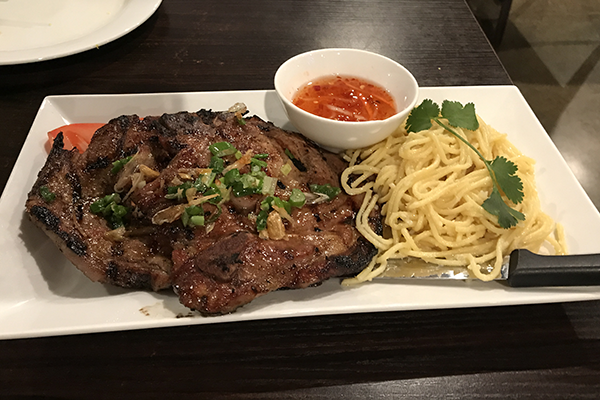 It’s hard to go wrong with tender grilled pork chops and al dente garlic noodles. Although we loved them, grilled chicken vermicelli was our favorite. I wasn’t sure what to expect when ordering, but this was a bowl laden with noodles, bean sprouts, cucumber, carrots and grilled chicken. Chopped peanuts provided the perfect finishing touch to the dish. DANVILLE – Fans of the San Ramon location are raving about the new Fat Maddie’s in Danville’s Blackhawk Plaza. If you’re in the mood for a burger, it’s a great destination. I quelled my desire for something spicy with the jalapeño version. Not for the sedate, these burgers feature a half-pound of grass-fed Durham beef. Mine had just the right “juicy factor.” It was stacked high with bacon, jalapeño slices and pepper jack cheese. I enjoyed it with a side of french fries. 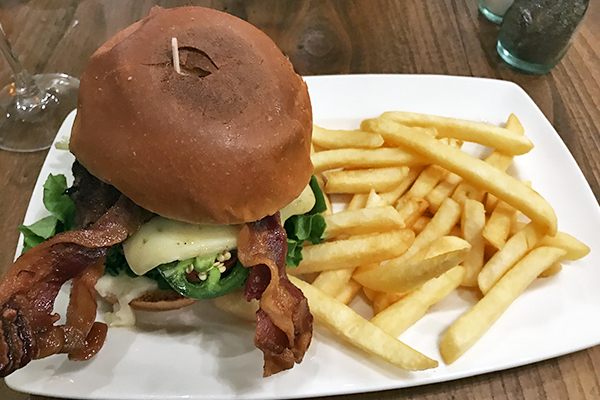 If you prefer chicken, you can’t go wrong with the Cali sandwich topped with bacon, swiss and avocado served on sourdough. It’s lighter than the burger, but still quite satisfying. Fat Maddie’s is kid-friendly, with menu selections for those under 12. 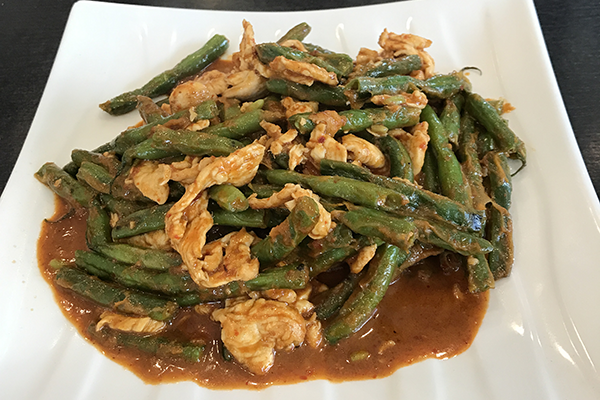 Stir-fried Thai green beans with slices of chicken breast at Basil Delight. Photo: Janet Fazio. PLEASANTON – If you like Dublin’s Thai Basil Express, you’ll love their sister restaurant, Basil Delight, in Pleasanton across from the outlet mall. The concept of a husband and wife team, the duo designed a menu featuring recipes from their homes in Thailand and Malaysia. I loved the Thai green beans with slices of chicken breast. The dish was sautéed in curry paste and had just a hint of heat to it. Normally, chicken curry is my go-to dish, but I went outside my comfort zone and ordered salmon red kari instead. It’s what we’d consider a typical curry dish with coconut, basil and red curry spices. Large chunks of fresh salmon, bamboo shoots, red bell pepper and basil filled the bowl. I was worried it would be fishy, but it was outstanding. I definitely recommend! LIVERMORE – I’m not sure who Tommy is, but he’s got it going on at Livermore’s Tommy Katsu. Tucked away in a shopping center, the spot is warm and inviting and the eclectic menu has something for everyone. Since it was our first visit to the restaurant, my date and I ordered their signature dishes. 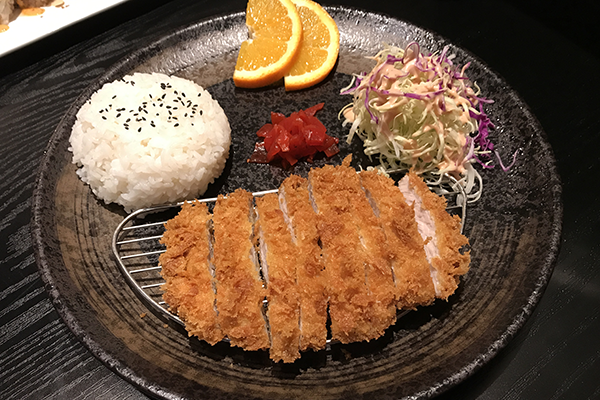 Tommy Katsu, a pork cutlet dipped in panko and deep-fried, was tender and moist. We gave the Tommy roll, with spicy tuna and cucumber in and tuna and mango out, a big thumbs-up. My favorite was gyudon, a bowl filled with rice, sliced beef, onion and bell pepper. It was bursting with flavor. Entrées start at $11. Beer and wine. Open daily. Hours vary by day. 2476 Las Positas Road, Livermore. Janet Fazio writes ‘Tastes of Your Town’, a monthly feature on East Bay dining in the print editions of Your Town Monthly. A version of this article was originally published in the April 2019 East Bay editions.